^ NebraskaStudies.org. 2009. 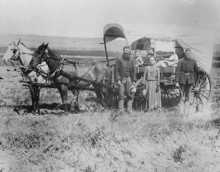 "1854:Kansas-Nebraska Act Signed." http://nebraskastudies.unl.edu/0500/frameset_reset.html?http://nebraskastudies.unl.edu/0500/stories/0502_0100.html . Retrieved February 3, 2009. ^ The Handybook for Genealogists:United States of America, 10th ed. (Draper Utah:Everton Publishers, 2002). ^ Marsha Hoffman and Dwight A. Radford, “Nebraska,” Redbook:American State, County, and Town Sources, 3rd ed. (Provo:Ancestry, 2004), 408. ^ Note that Nebraska's designation as a "triply landlocked" state does not consider the fact that Minnesota, Wisconsin and Illinois have ports on the shores of the Great Lakes that have access to the seas. ^ Jirovsky, Kristin. "Owner of Nail Jack Tools wants to share former Vise-Grip plant", Lincoln Journal-Star. Jan 8, 2009. 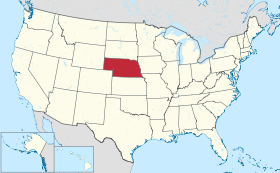 ^ "Nebraska as a State". Andreas's History of the State of Nebraska.. Retrieved February 18, 2010. Hickey, Donald R. Nebraska Moments:Glimpses of Nebraska's Past (1992). Nebraska State Databases – Annotated list of searchable databases produced by Nebraska state agencies and compiled by the Government Documents Roundtable of the American Library Association.